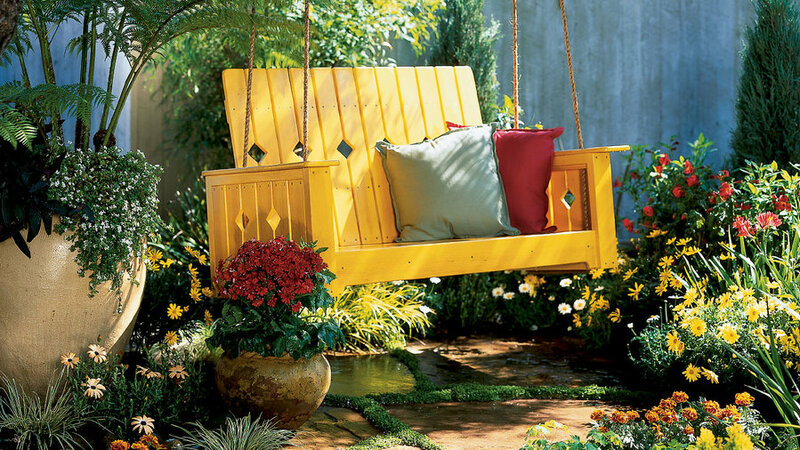 This high-backed swing hangs securely from sturdy, 5/8-inch-diameter nylon or hemp rope that runs through the swing’s arms and frame. A yellow transparent stain emphasizes the grain of the wood; it is also protected with several coats of an exterior, satin-finish polyurethane. The average woodworker can build the swing in a weekend; staining and sealing will add several more days, due to drying time between coats. Most cuts can be made with a circular saw, handsaw, or saber saw, but the angled back support would be more easily cut with a table saw. A full-service lumberyard can generally do this for you.